Losing a physical home button will require users to adapt, but it should be an easy process. When I wanted to change apps, I reached down instinctively with my thumb to click the home button—but then, realizing I was using an iPhone X, I simply redirected my thumb to swipe up from the bottom of the screen, just as I would today to call up Control Center. One quick swipe and the current app goes away, replaced by the home screen. It'll take some getting used to not having a Home button, but fortuantely, the new gestures are intuitive. Likewise, double-tapping on the sleep/wake button to trigger Apple Pay seemed natural, as did holding down that button for a moment to bring up Siri. I don’t think iPhone X users will miss the home button for very long. I wasn’t able to train the iPhone X to recognize me for Face ID, but the Apple employee assigned to the phone had been. Face ID unlock seemed to work with her just fine—and only when she looked at the screen, as intended—but there were a few quirks. Sometimes the screen would go to sleep before she unlocked the phone, and more than once she accidentally pressed the side button and triggered Siri. I’m going to chalk this up to a new product and a scenario pretty far out of the norm. Once the phone was unlocked, I got a few minutes to pose with Apple’s new Animoji images, which will use anyone’s face (not just a face that’s connected to Face ID) to animate cute emoji icons. This feature is incredibly novel and fun and I suspect will launch a zillion memes—as well as a million homemade animated movies featuring the adventures of pig and fox. Though the iPhone X will probably be referred to by most people as having a screen covering the entire face of the device, that’s not actually true—there’s a notch at the top of the display that packs in the TrueDepth camera system as well as a speaker, microphone, and more. It’s a little weird having the notch there, or perhaps it would be more accurate to say that it’s a little weird to have active display around the notch. You can swipe down from the upper right corner of the screen to reveal Control Center, for instance. 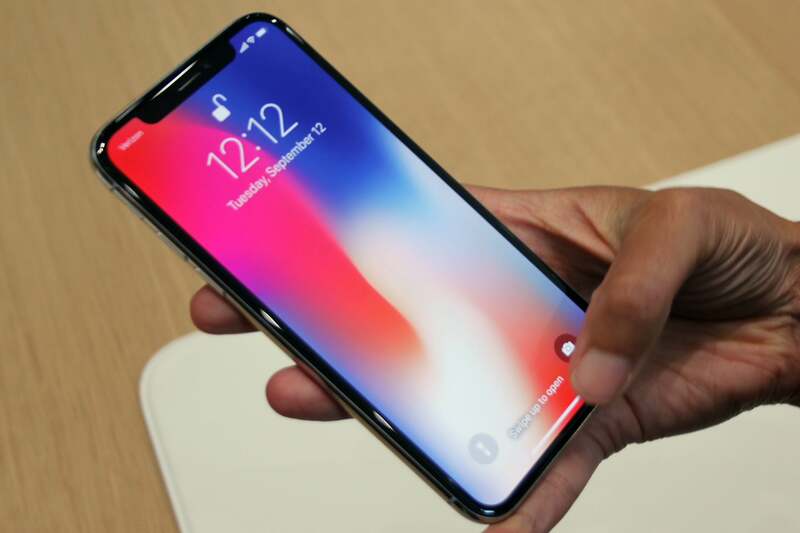 The iPhone X features a 5.8-inch Super Retina HD HDR display that supports True Tone, P3 color gamut, 1,000,000:1 contrast ratio, and a 2436-by-1125-pixel resolution at 458 ppi. I did notice that Apple has built the TV app to properly frame a video without the notch—when holding the phone in landscape orientation, the video is sized so that the side that’s on the same side as the notch ends right at the notch. 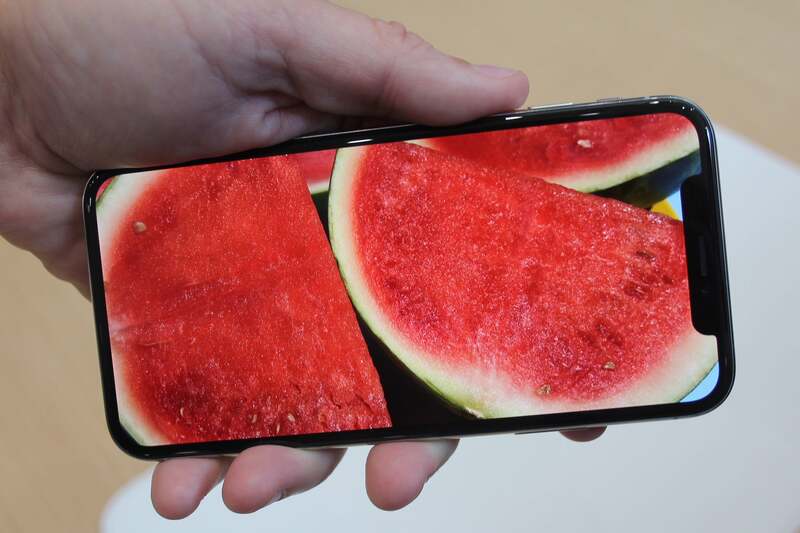 If you want to make the video bigger, you can double tap as usual, and it will fill the screen—which means that part of the film’s image will be masked off by the sensor area. You get to choose if it bothers you. Still, the iPhone X is familiar—when you hold it, it’s undeniably still an iPhone. Even if it doesn’t have the home button that was once the trademark of the iPhone line.